References: more information you can find here, here, here, here, here. 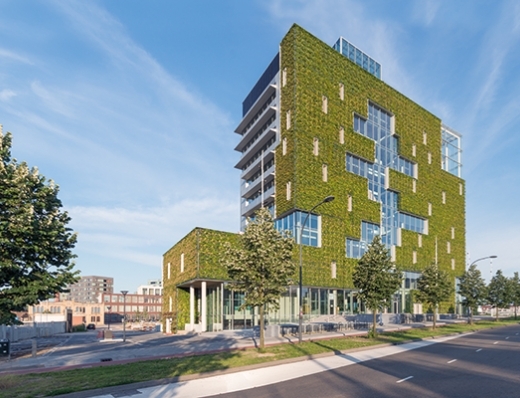 About: The project comprised building and designing the municipal offices of Venlo City Hall in accordance with the circular principles of cradle-to-cradle (C2C) and also in accordance with Green Public Procurement principles. The municipal offices purify outside air, generate energy and there is a closed-loop water recycling system. The municipality has used many C2C solutions, such as a green climate facade, heat and cold storage, a helophyte field for wastewater purification, solar chimney, greenhouse as green lung, triple glass and solar panels. The furniture was also procured according to circular economy principles. The project arose from the ambition for the city and region to function according to C2C principles. The municipality also wanted to inspire the region and attract innovative companies to adopt Green Public Procurement principles. The architect was selected according to vision on C2C and sustainability. Market consultations were held for the design and systems. The municipality then conducted a pre-selection based on experience, knowledge with the chain and capacity. In the call for tenders for the furniture, information requested included the components of the products and the possibility for disassembly. The ceiling amount for the design was € 2 million, in which a guaranteed residual value of 18% was agreed. This good practice was first analised during Rebus Project- REady for BUSiness – Integrating and validating practical entrepreneurship skills in engineering and ICT studies (2017-2019). Project intends to support development of key competences for employability that will guarantee more flexibility in the labor force and allow to adapt more quickly to constant changes in an increasingly interconnected world. The Green Deal on Circular Procurement (GDCP) is an initiative of MVO Nederland (CSR Netherlands), NEVI, Central government, Duurzame Leverancier, PIANOo, Kirkman Company and Circle Economy. Various pilots originating from GDCP are partly financed by the European REBus project, implemented in the Netherlands by Rijkswaterstaat (DirectorateGeneral for Public Works and Water Management). They are working together to support businesses and government organisations in their circular procurement ambitions. • Part of the ventilation system is a 2,000 m² green climate facade, which is connected to a greenhouse, open spaces and a solar chimney. • The building produces over 60% of its own energy and uses no gas, which makes it CO2 neutral. • The building is also triple-glazed, has a rainwater harvesting pump, waterless urinals, a helophyte filter, solar panels, a solar collector, heat recovery system and LED lighting. Various solutions contribute to realising the city’s C2C ambition. This ambition focuses on the use of clean energy, with the building as raw material bank that purifies water and inside and outside air. The €3.4 million investment in sustainability measures will deliver savings of € 16.9 million during the 40-year usage term. The business case results in a positive cash flow as early as after the first year. Already in 2008, the Venlo Region embraced circular principles based on „Cradle to Cradle”. Meanwhile, Venlo has almost 10 years experience with the circular economy. That is why Venlo is one of the few places in the Netherlands where circularity has not lingered in ambitions or pilots. Venlo is a place where this has been put into practice in all its aspects and where results are achieved really visible. Not in the form of a single pilot project, one building or one area development, but in many projects and processes, many buildings, multiple area developments. At companies, institutions, education and citizens’ initiatives. • Design with the eye for future generations (sustainable development). The difference with sustainability or traditional circular economy in the Venlo approach lies in its concept „health”: the starting point is only the use of completely healthy and safe materials and clean energy. Recycling environmentally harmful materials does not fit with that, the challenge lies in it design and implement safe, healthy products that are infinite, without environmental pollution and can be kept in biological or technical cycles without loss of quality. In here Venlo distinguishes itself from many other regions. The circular ideas have landed well in the Venlo region, through clear inspiration frameworks and as part of the regional vision and individual city and village visions. The Venlo Principles are incorporated in the regional vision, in strategic and tactical policy frameworks, and practically applied in projects and processes. There is no regional tightening Governance on the theme, but there are therefore strong inspiration frameworks and an ecosystem of parties that cooperate in varying composition. That is exactly what has caused that much parties have embraced the circular ideas and have actually started working on them. In the municipality of Venlo there is a high-level coordination team (mayor, city secretary, director, policy strategists) that monitors progress. In addition, there is an official core team for the execution. Around 100 employees in the Venlose organization have had a two-day training and apply this in their work. In addition, a team of 10 officials working together with 10 people from education and the construction industry have been trained for a week in circular principles by the Environmental Protection and Encouraging Agency (EPEA) in Hamburg, one of the founders of the circular economy. • In a year time 17,000 people circulated in the circular City Office, of which about 30% from the abroad – from international (trade) delegations to Venlo associations, residents, entrepreneurs, education and work visits. The following (groups of) parties are involved: Fontys Hogeschool, Citaverde College, HAS Hogeschool, Province of Limburg, Chamber of Commerce, Regional Municipalities, C2C ExpoLAB, Blue Innovation Center, and park management organizations. In addition, citizens’ initiatives such as Samenstroom, Het Beleg van Venlo (urban agriculture), and the Regional Energy Alliance. The Economic Development Board Venlo has embraced Circular Economy as an umbrella organization spearhead, under the name “Circular and Beyond”. EDB thus goes a step further „ordinary” circular economy – the road that the region has been using for years. More and more companies fit circular processes in their company suspension and have proceeded to develop and certify circular products, such as Agmi (traffic signs), Ami (door fittings), Van Houtum (paper) etc. The building is first and foremost a location where visitors come and where officials work, but at the same time is a place where safe and healthy materials are used, where energy is generated and where the water and the air are purified. The massive green facade at the north side (with about 8 plant species) stimulates biodiversity (birds breed and stay there, insects etc) while also being an integral part of the water system and the air system. Also the green roofs and the indoor gardens with water features have an ecological function and purify it water (helophyte field). „Daylight shutters” to limit the energy consumption for lighting. 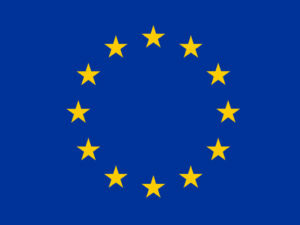 During the design phase of the building was an additional investment of 3.5 million compared to the program of requirements euro in sustainability measures, because this will save up to 17 million euro in the exploitation phase. The lessons learned have meanwhile been applied to other projects and area developments in Venlo, such as a few schools, sports halls, traffic infrastructures and the redevelopment of a 22 ha defense complex against the center of the city to one work location with leisure concepts, in which energy, water, green and cultural history preservation elements have a prominent place. This practice is a good example of how the principles of the circular economy should be applied and should be replicated by as many European municipalities. • The C2C profit is significant. By putting people first, the building offers added value to the user regarding acoustics, climate and atmosphere. • The raw materials used will always continue to be used at the same level, will never lose their value and will remain available for new products, and that also offers added value to the building. • In new projects, the Municipality of Venlo will increasingly examine the possibilities of applying the C2C philosophy. • Make sure there are „ambassadors” for the practice within the decision-making layers. • Be realistic. Do not only look at C2C certified products. There are many more equivalent options. You do, however, need to check these in advance. The Municipality of Venlo asked C2C expert, Michael Braungart, to do this. • With a good business case you can demonstrate that higher investments will pay for themselves in the longer term.